I am exploring the visual experience and trying to capture what I see and feel about the world around me. All too often I find myself rushing through life and not seeing. Drawing forces me to take the time to see and appreciate my environment. Today we have had more snow than any December. It is cold and windy. So I thought I would think of a warmer time. 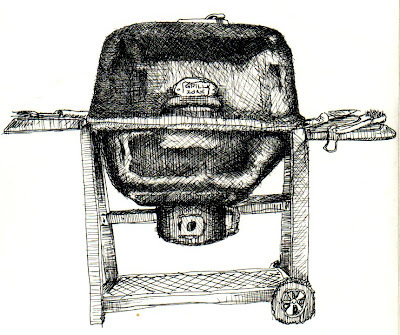 I was sitting on the deck and began sketching my grill. As I progressed I realized I had managed to capture another image within the grill. I realized that the reflections that captured in the grill was actually a picture of my house. What do you unintentionally capture in your drawings? Another warmer day at the beach. I rejoined the workforce this week after 10 months of semi-retirement. You would think that I should have lots of time to sketch and post, but alas the to-do list seems to get in the way. I have managed a few sketches from time to time, just not found the time to get them posted. This morning was a good opportunity for me to get something posted. I found a new pencil the other day and finally ordered one. It is the MLP2 Zebra, a 9mm 2B flat lead mechanical pencil. 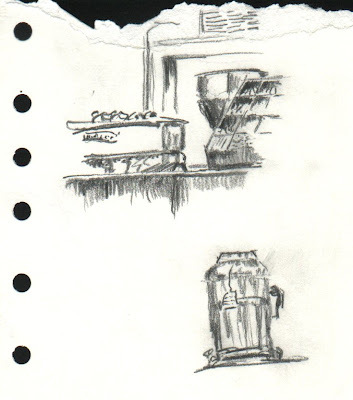 This morning I made a quick sketch while I was at the coffee shop. Better detail of the sketch. The other day I made a trek to the doctors office for my annual poke and prod session and did some sketching while I did the obligatory wait. 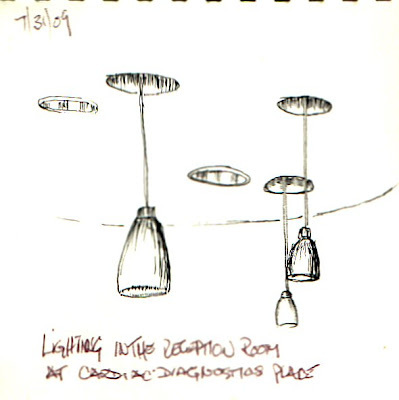 I spied the lights over the reception desk and decided to sketch them. When I went to one of my sketching classes I showed some of my sketches done during the week between classes to the other folks in the class. 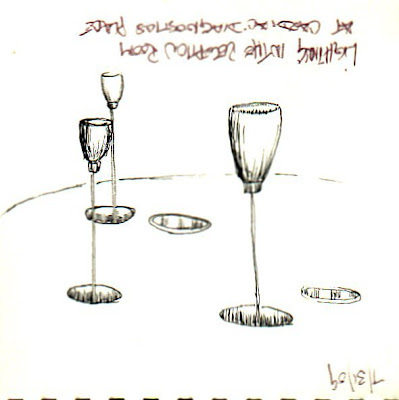 Someone mentioned that they looked like wine glasses from their viewing angle (upside down). Well, I have finally scanned another sketch class effort. 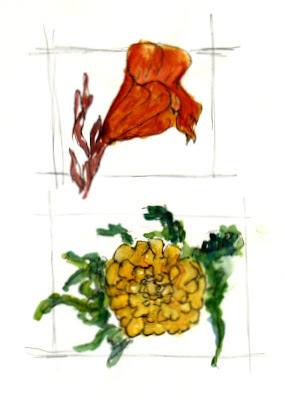 I first sketched the flower with pen and then added the watercolor. It was fun, but I can really see that I need some help and practice with the colors. Hopefully I will get more opportunities to work with this approach.